*This post in partnership with Floor & Decor. I’ve always turned to paint and fabric as tools for dramatic transformations but let’s go ahead and add tile to that list too. 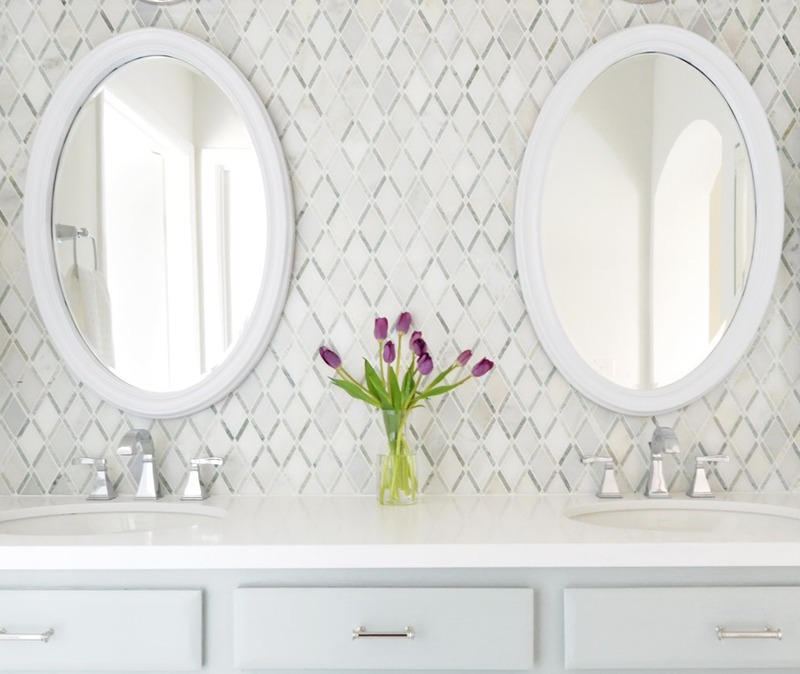 This master bathroom vanity space has been a work in progress for six months, in it I repurposed the existing cabinet and designed around it, but the wow factor comes from this new diamond pattern backsplash tile. This shared prep space isn’t grand in size, it’s six feet across with an eight foot ceilng but the problem was it was stuck in the late 80s with its builder grade cabinets, shiny brass fixtures, and dated vanity lights. 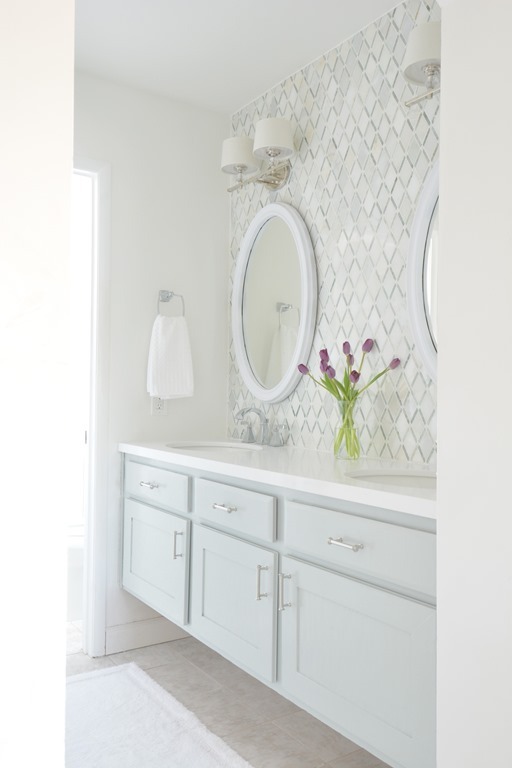 I knew I could make it a stunner with the help of some beautiful tile, fresh fixtures and paint – voila! Back in January, we reworked the existing vanity to create a floating vanity by removing the countertop and base and building a new support system. I also reversed the doors to take advantage of the Shaker style on the other side. Now the style is far more contemporary! Matt reminded me of something I had forgotten. When we first bought this house last year, the entry to the master bathroom had saloon doors, with it came a few John Wayne impersonations… "Hey little lady, what say we ride into the sunset over to them pretty red rock mountains …." 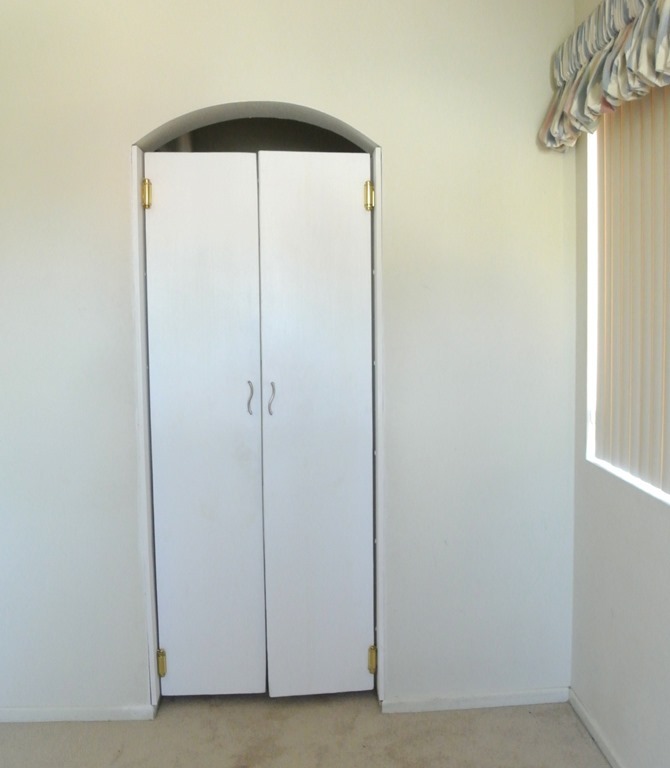 I never understood the need for these doors, they were so strange and blocked all the light from the bedroom, also unnecessary for privacy since the shower room is separate. Check out those old blinds and balloon valances too, aw yeah. The entrance is so much better with no doors and natural light! I replaced the medicine cabinet on the right with a simple beveled edge version and removed the medicine cabinet on the left by filling in the gap with framing and drywall to allow for a ring towel holder. I also repainted the vanity a different color, this is Silver Marlin by Benjamin Moore, it has a green undertone to complement the tile, better than the blue undertone present in the previous Winter Solstice it was painted before. But back to the tile. It comes in boxes and I shopped for it at Floor and Decor. 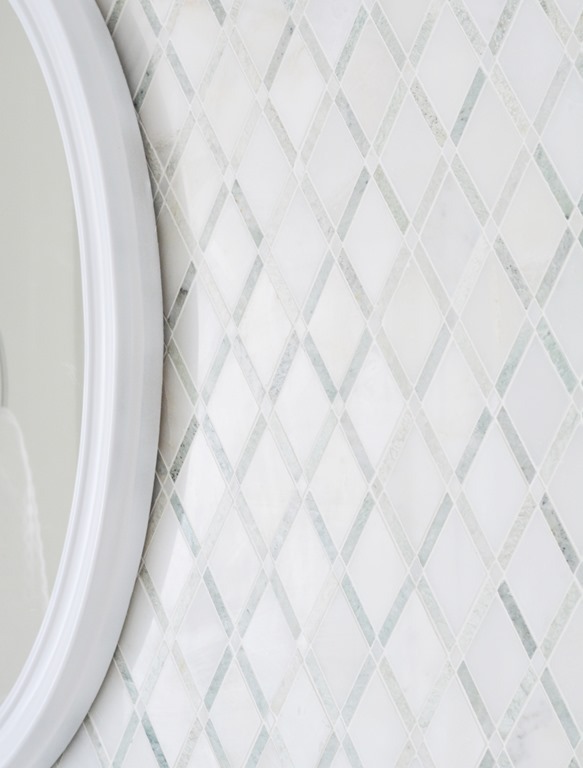 This is the diamond pattern Carrara White Caribbean Green Mosaic, I spied it online and went into their store to check it out in person and was Insta smitten, the diamonds are grey and white and the diagonal pieces are all shades of green, some light some dark, the variegated tones makes it more interesting up close. 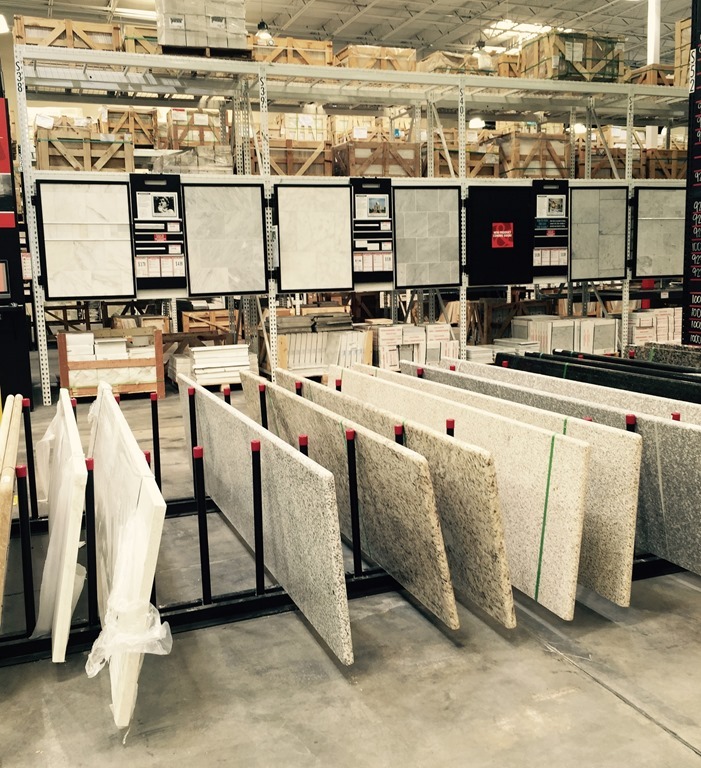 I had never been to a Floor & Decor store before, I was impressed with the selection, prices, and the quantities! 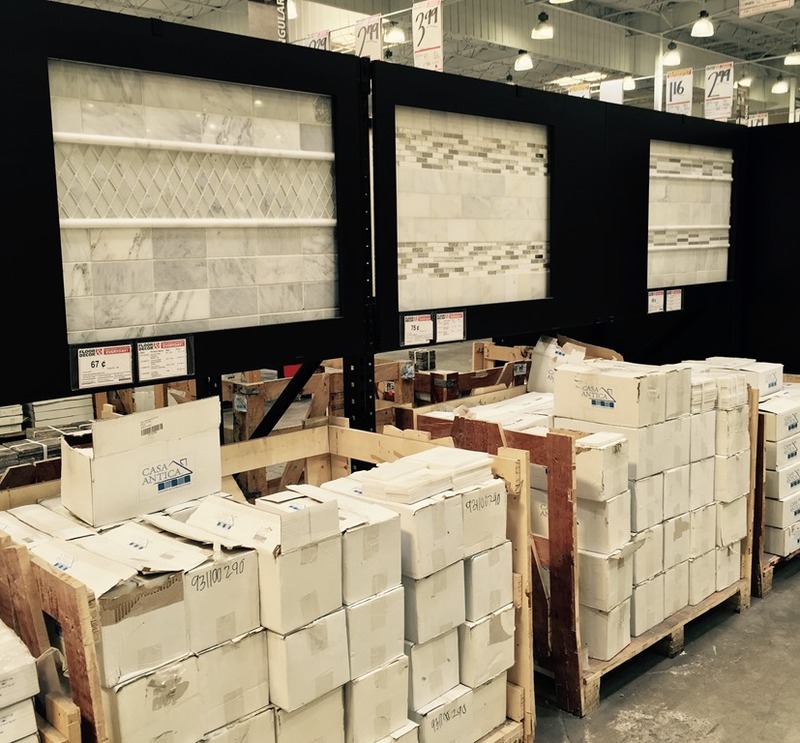 The stores are HUGE, 60,000-80,000 square feet and each store stocks thousands of tile, stone, and wood products, ready to take with you for your project because they keep hundreds of square feet in stock. They carry tile, wood, laminate, and vinyl plank flooring, countertops (butcher block and granite), and supplies for installation of all these surfaces. The manager Bill gave me a tour of the Las Vegas store (thanks Bill!) and I learned they source directly from manufacturers around the globe to guarantee the lowest prices. I had great customer service, Floor & Decor also has a design center with on site inspiration offering free design services to help you pull a look together. 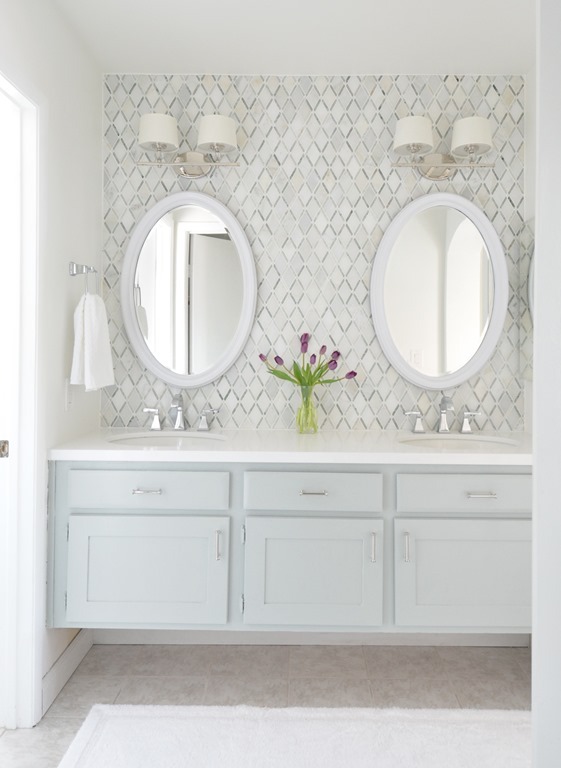 For the design of this space I chose overhead vanity lights instead of sconces. 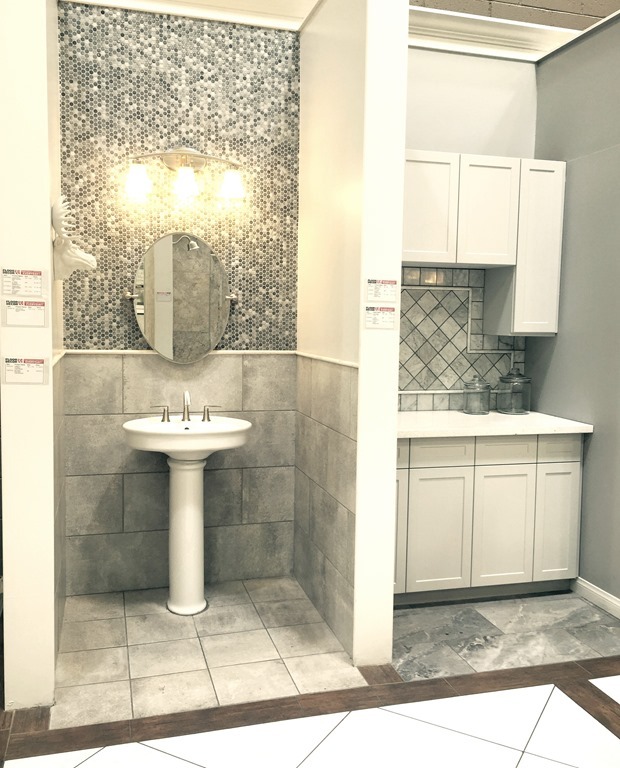 I love a sconce/mirror combo with a single sink but for this double sink there wasn’t quite enough space on the sides of the mirrors, so I chose vanity bath lights. 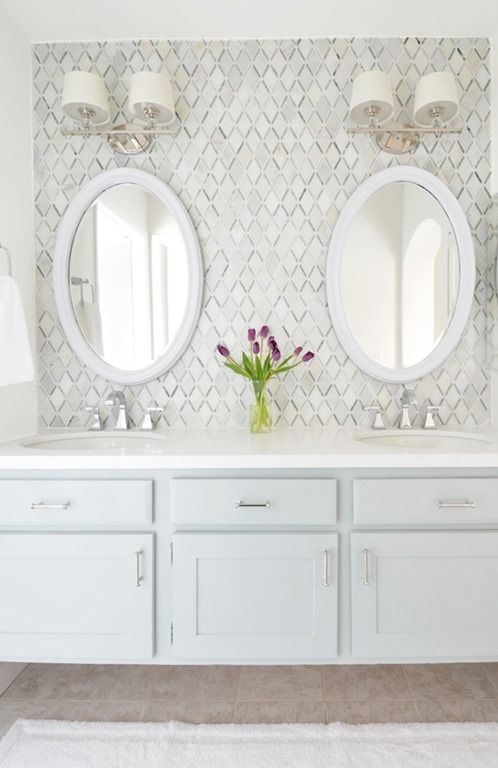 Also since the ceiling height is eight feet, the vanity lights above elongate the space and draw the eyes up as does the diamond tile installed in the vertical direction. The countertops are Caesarstone, I’ll have more to share on this quartz surface after the kitchen remodel reveal since we installed the same surface in there. 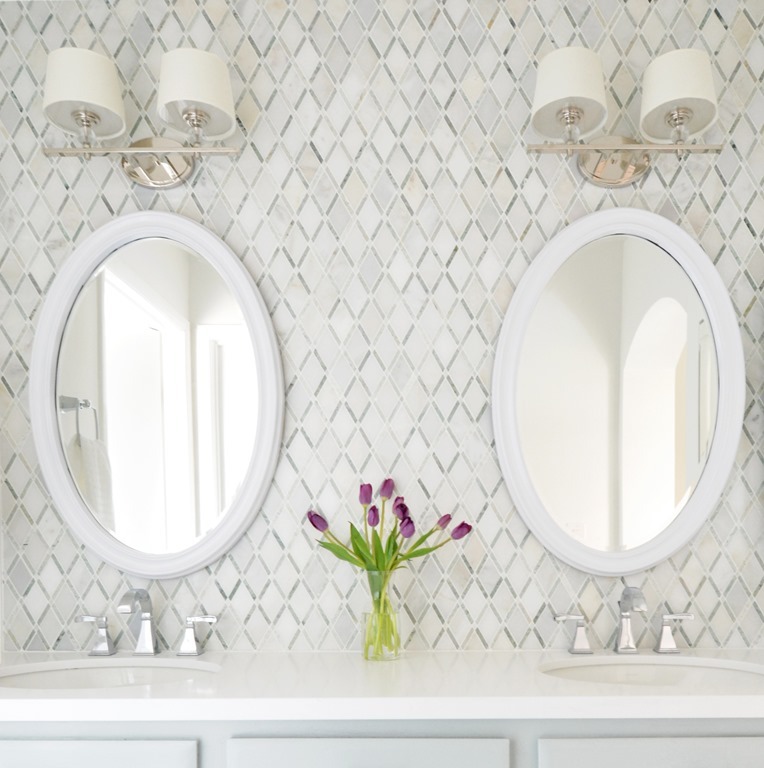 I also opted for chrome faucets and oval mirrors below the nickel vanity lights – see sources below. 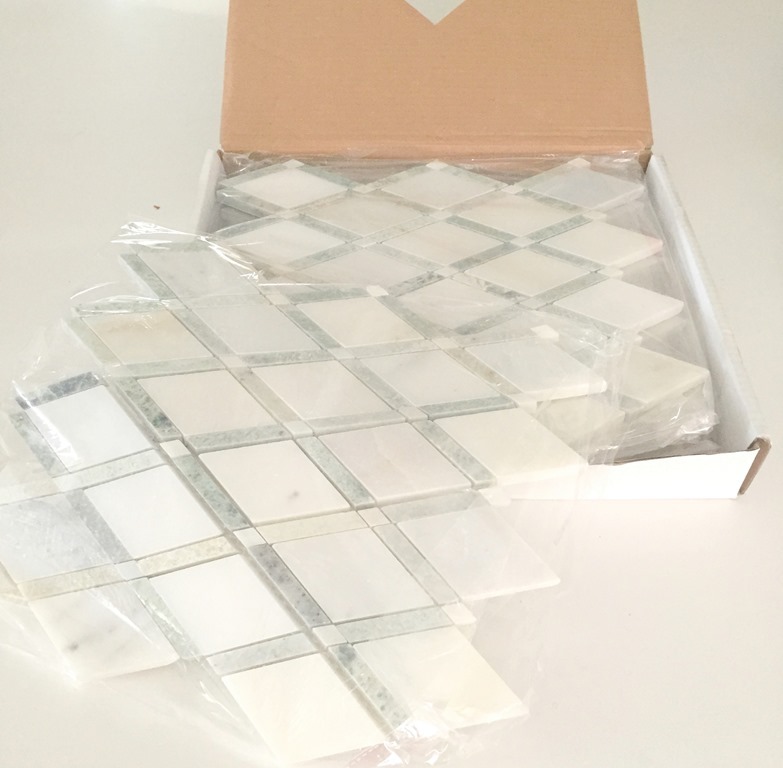 Installing a mosaic tile backsplash isn’t difficult, I’ve done it myself in bathrooms and in kitchens and even tiled planters before. 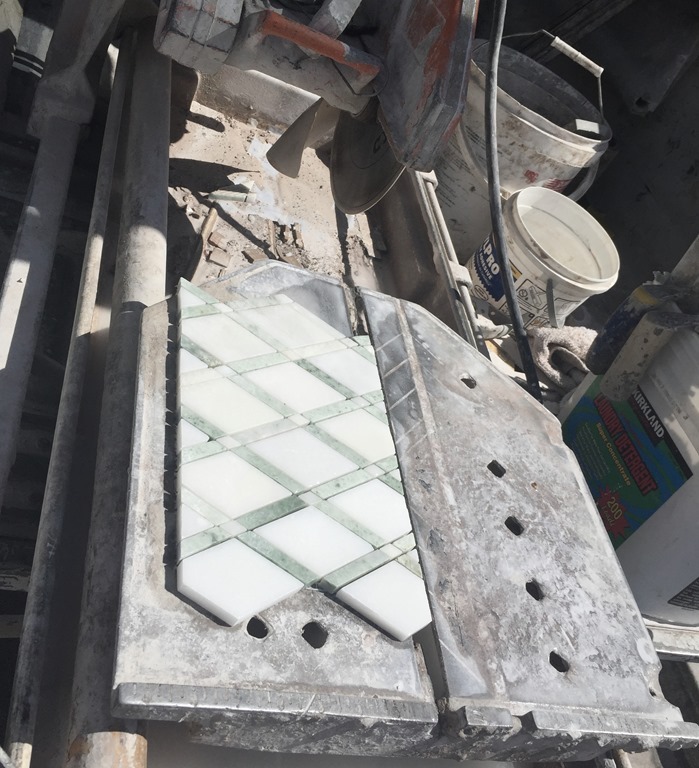 For this project I hired a helper because I didn’t have a tile saw in Las Vegas among my tools. You can rent them of course but instead I enlisted the help of the same subcontractor who helped us install the tile floors to bring over his tile saw and help install the tile on the wall. 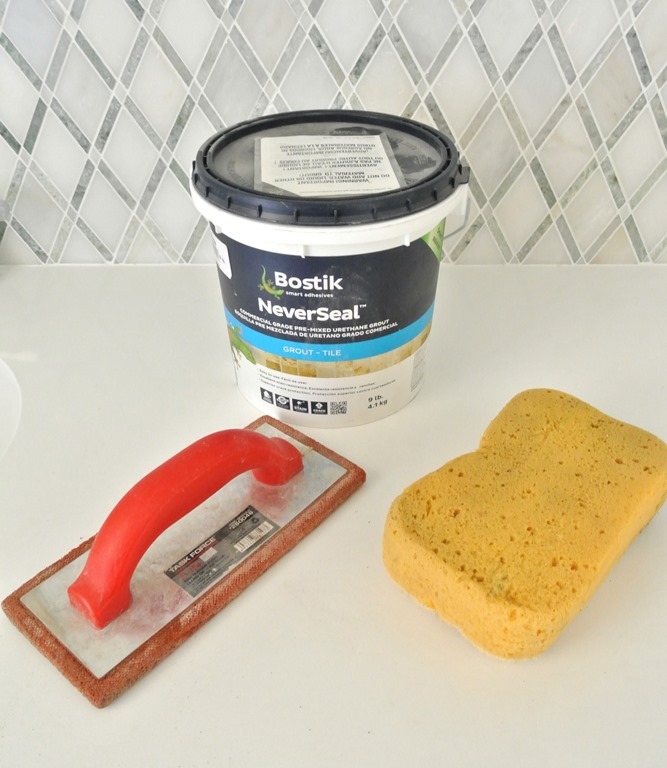 Apply a thinset mortar or tile adhesive with a trowel, use a level to ensure the tile is even. A tile saw is a necessary tool for the side, top, and bottom cuts, also if you’re working around light switches. If you’re inexperienced definitely hire a professional but you can also rent a tile saw and do it yourself. 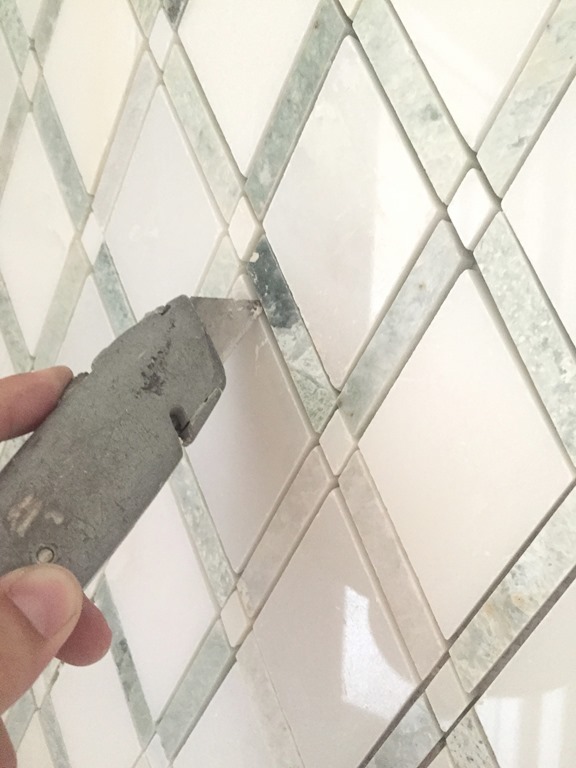 There were a few sheets of tile that had really dark green diagonal pieces which I didn’t care for so I removed them and substituted lighter pieces with a box cutter blade. 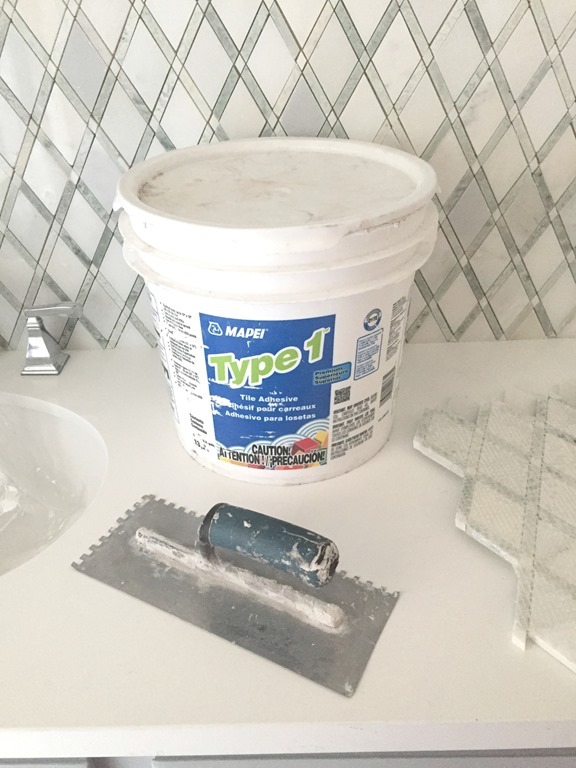 Allow the tile to set for a day then apply the grout with a grout float, wipe it down with a sponge, you can buy premixed or dry grout and mix it up yourself. I couldn’t be happier with this tile! It did require some tweaks to get this it just right, selecting the individual sheets in the store and removing a few of the dark pieces, but wow, I think it’s absolutely stunning, I wish you could see it in person and touch it too. *This tile project and post is sponsored by Floor & Decor, the tile for this project was complimentary and I was compensated for my time, all opinions are my own. Such a great idea to reverse the doors to the other side. Never thought of that. Love the tile! As usual you have outdone yourself Kate, it’s simply gorgeous! Genius idea to flip the doors! Did you have to do anything special with the hinges? I just painted right over the hinges Allison, and the grout is Bright White Melinda to match the countertop. Thanks so much everyone, I love it toooooo ! Wow that looks amazing! Such a brighter and spa like look, it definitely makes the room feel spacious and glamorous. 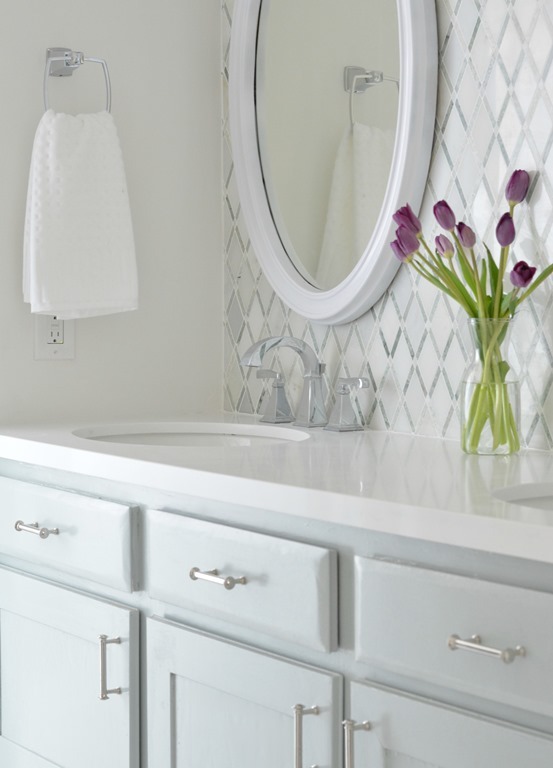 That diamond tile is fabulous and looks so good with the vanity. You have done what I’ve been wanting to do for quite some time. large mirror out of there.. Lovely job and great looking too! Oh my gosh, stunner is right!!! It’s gorgeous! Reversing the cabinet doors is pure genius!!! this is where we bought the tile for our new master shower too, I love this store! You bathroom is absolutely beautiful, what a fabulous improvement! Beautiful transformation! I love it! 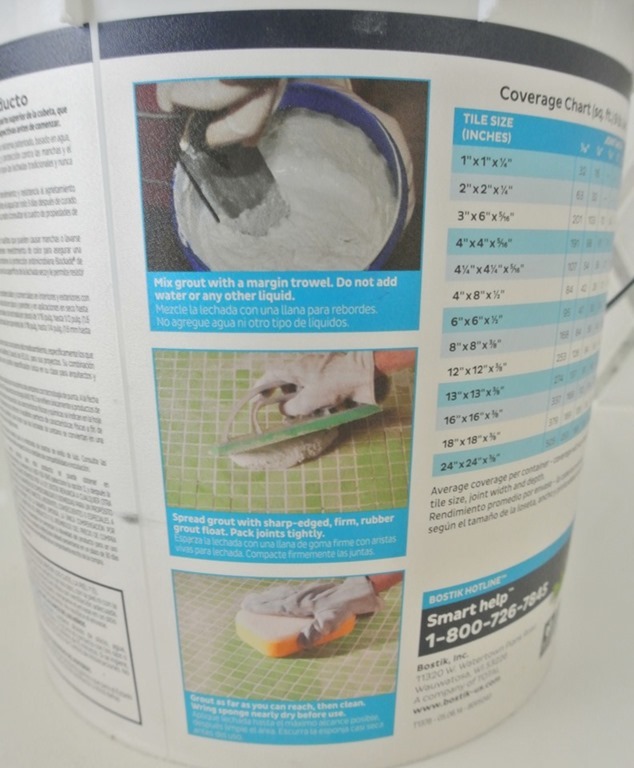 What color grout did you use? Everything looks beautiful!!! 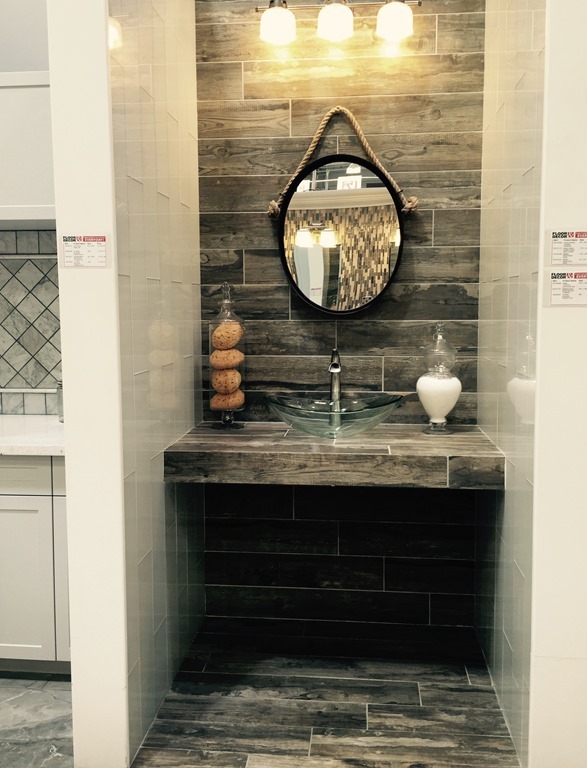 The vanity and tile look amazing! I love your light fixtures above the mirrors. Where did you get them? What a stunner! I love the tile you picked and that you switched the doors- brilliant! It’s beautiful! How did you hang the mirrors? Did you put a nail through the grout? If so, did you need to make sure the grout was centered over the sink? Hey Kelly, it’s a screw into the grout, we adjusted the hooks on the back to make it work, but you can also drill through tile with the proper drill bit. It looks beautiful. I will remember your genius trick about cabinet doors! Beautiful. I love the diamond look! Love it all! The tile is gorgeous! Absolutely beautiful and brilliant, Kelly. My 1980’s vanity area off the master is this same size ceiling height currently with old oak vanity sink area and drop-down makeup area, ugly and impractical. Your bath redo goes to the top in my inspiration file. Very nice recognition at Maria Killam’s Facebook! One of the best of the best renovations. Beautiful! You did such a great job in choosing the tile and the color of the paint. I LOVE the tile. Great job! Great job! 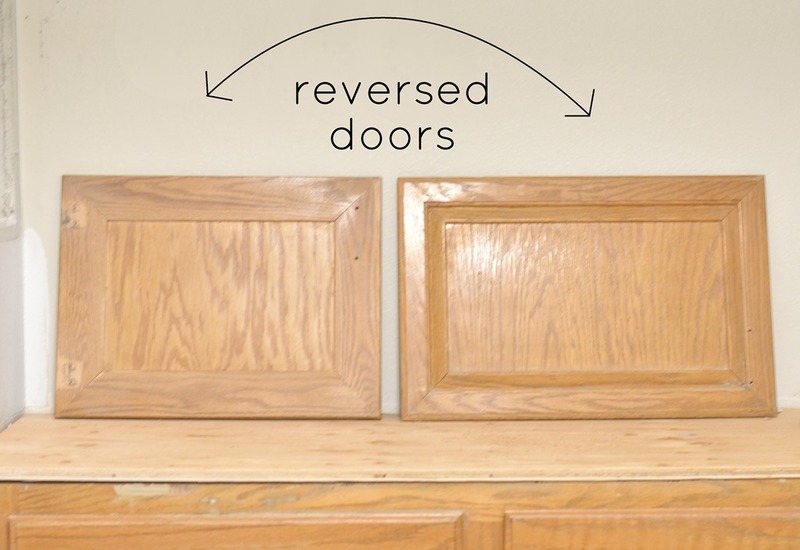 I love the idea of reversing the doors – that’s ingenious! I’m all about reusing & repurposing objects, rather than throw them away and buy everything new. Wow! So clean and gorgeous! Kate, its gorgeous! 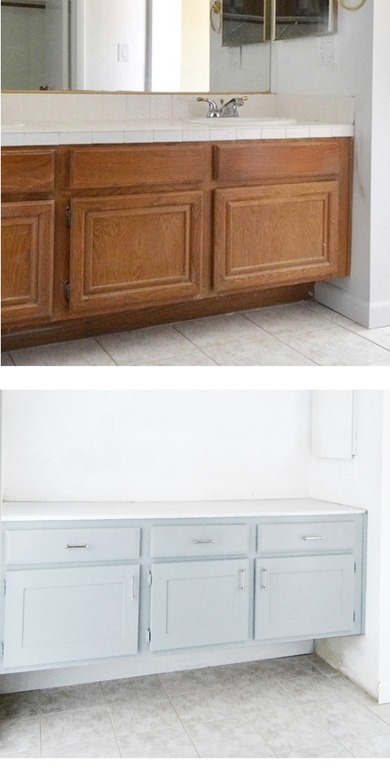 Quick question – how do you paint the cabinets? It is by hand with brushes or with a sprayer? I ask because I’ve repainted a cabinet by hand but it took a lot of work to ensure I eliminated brush strokes and sanded between coats, etc. Any tips on simplifying the process while getting a beautiful finish? Sorry for the questions but your work is stunning and I would love to replicate it just a bit! 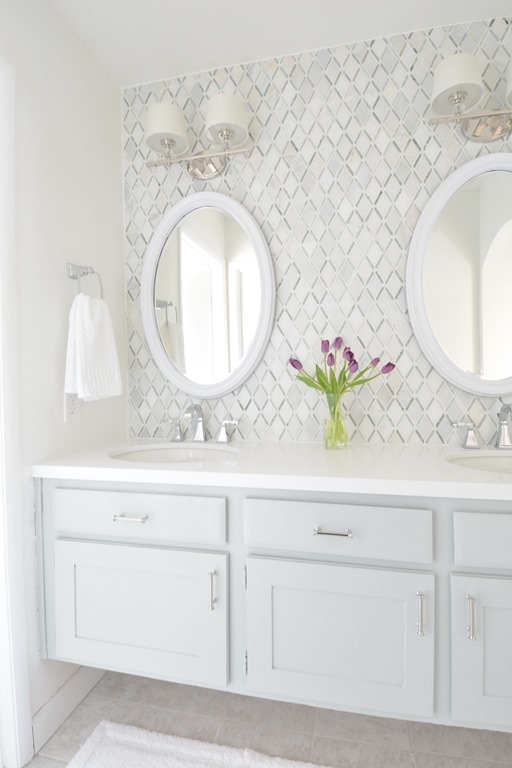 Such a gorgeous transformation – the tile definitely makes it! Love the sconces too. That silvery gray penny tile in the store display is lovely too! Wow! What a great makeover! I love the varied shades of the tile. It looks fresh, but gives it texture. so SO smart to reverse the doors!!! Beautiful! I hope you’re proud of your work. Truly stunning! And thanks so much for the door flipping tip. I wouldn’t have thought of it and won’t forget it now! Thanks for sharing! I love the idea of flipping them! We have similar cabinets (don’t like them as is with the wood tone) off to check and see if they can be flipped! thanks! I bought my shower tiles and marble from Floor & Decor also. That place is huge and has great prices.beautiful transformation. Another successful project. Simply stunning. I love everything and the tile is amazing. Love the tile. I pickedthe same thing for an accent, approx 2’x3′, rectangle behind my cooktop. Except, mine has green diamonds, and white diagonals. The tiny connecting diamonds , and the 1″ half round”framing” around it are golden onyx which pick up the color of the natural maple cabinets. It was a splurge but definitely worth it. I’ll have to see if there’s a Floor & Decor anywhere around me. I started my master bath around the same time as you and couldn’t wait to see what you were going to do. It looks fabulous! Since mine was not a complete renovation, but instead an updating and upgrading, I thought it would be completed within a month. When it ended up taking over 5 months, I thought there was something wrong with me for sure and at times felt overwhelmed. It’s apparent your an organized experienced person, so I was relieved to see this project took six months. With so many decisions to make, these things take time. I forgot to mention we plan on redoing the shower and including the same tile in the shampoo niche – but that remodel won’t happen until winter. All I can say is WOW! I love reading about your transformations and this one is a stunner! 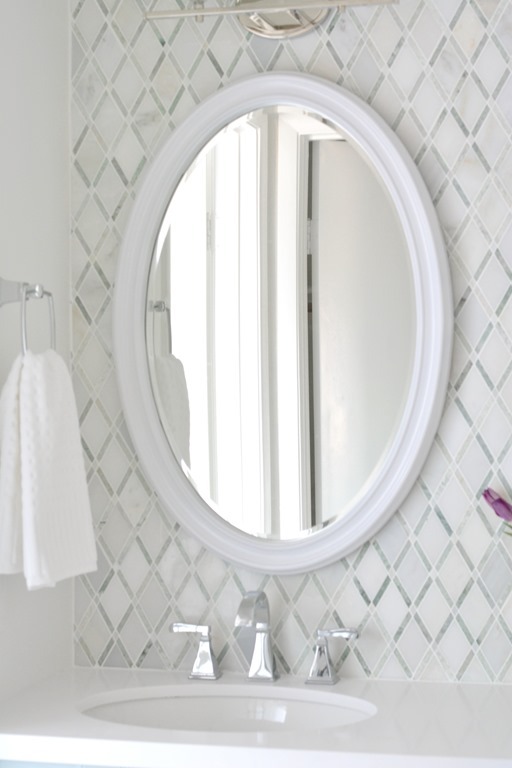 Love that tile! 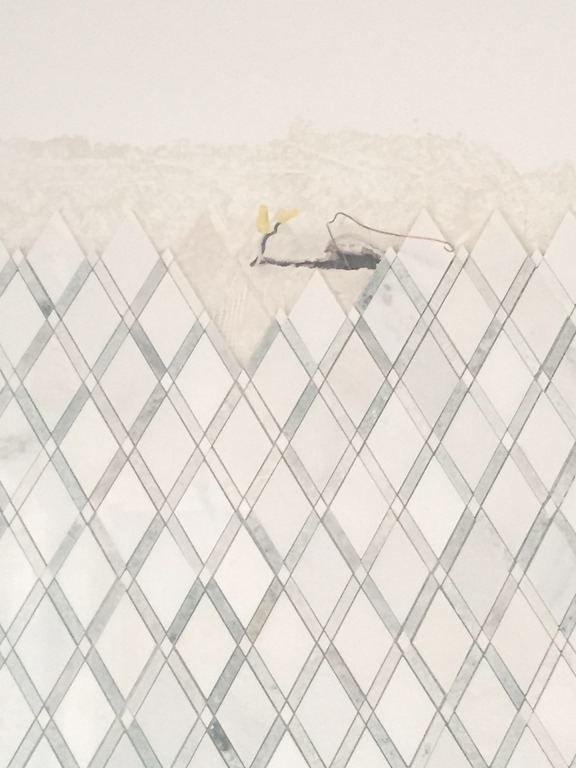 How do you think it would work on a floor or shower wall (perhaps as accent)? Or will I hate keeping all that grout clean? Nearest Floor and Decor is about 100 miles away but sounds worth the drive since I can hit Ikea and Ballard Designs outlet as well. HI, I’ve been following you for the last two years and I am so impressed with your work. It is always so fresh and beautiful. Every time, friends want to work on a wood project, I always encourage them to look up your website. God has given you an amazing gift. Thanks for sharing it with us, the readers. 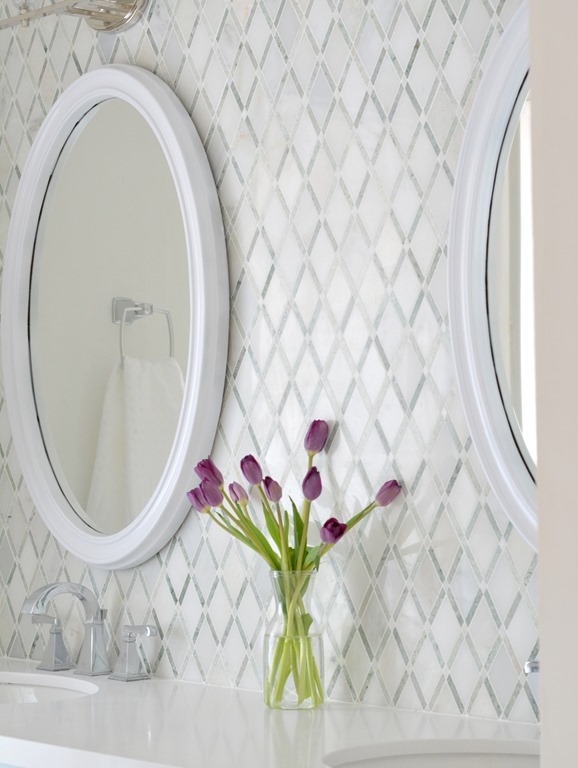 Kate, your bathroom makeover just takes my breath away! I look forward to all your presentations. Amazing. What color is the paint on the cabinets? Beautiful and relaxing bathroom. Another well done project. You are amazing! A stunning transformation!! You are truly gifted. Reversing the doors makes a huge difference, the tile is off the charts gorgeous, & your paint color is beautiful. Wondering if you have tutorials on how to make hinge holes invisible when reversing doors, & also the painting of those doors. Beautiful bathroom! 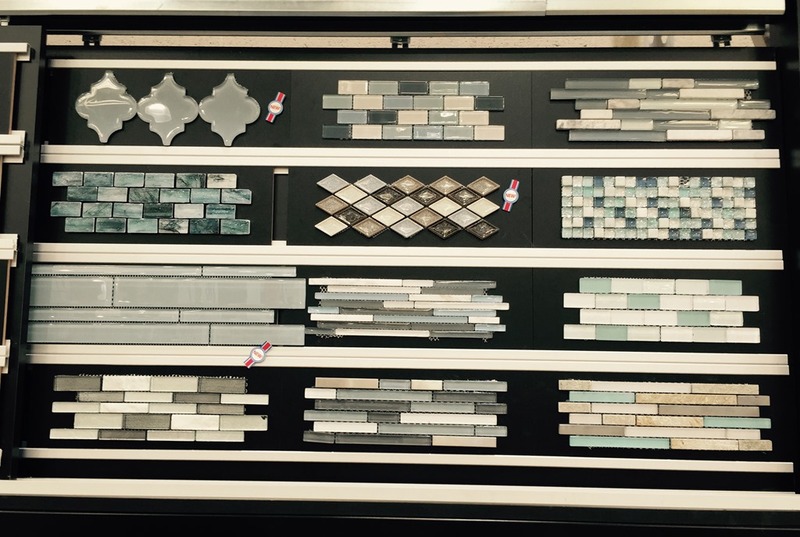 We are remodeling ours and can’t wait for the details on your quartz countertop! Beautiful transformation! We’re just about to redo our entire bathroom. The only thing we’re keeping is the vanity, which I will be painting. Could you tell us where you got the gorgeous light fixtures? 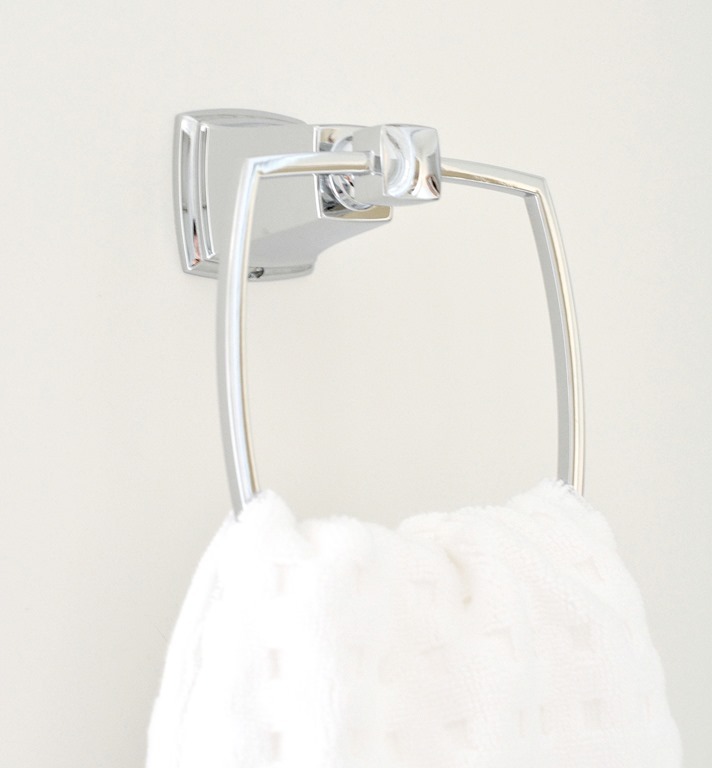 I’m still looking for a light fixture for our bathroom and the ones you found look perfect! Thanks a lot. The fact that you reversed the doors to create a modern shaker style door is absolute genius and the room is stunning. I have to agree with Mary Beth. That’s exactly what I was going to say. As I was looking through the pictures, I noticed the design on the doors were different and wondered how you did that. The I saw that you just reversed them and I was honestly surprised! What a great idea! I might do this to my bathroom now.Thanks for sharing! 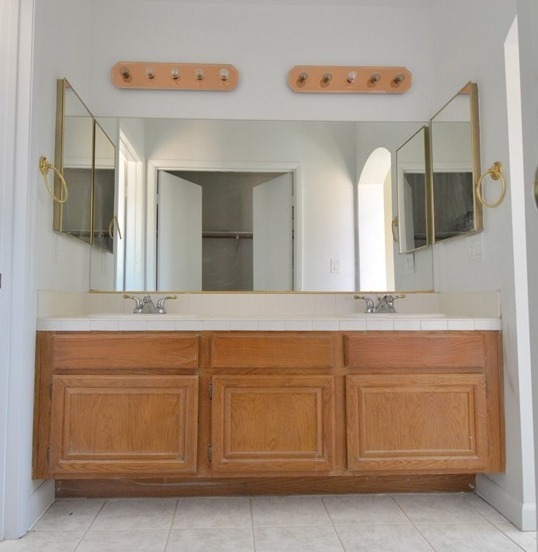 What were the steps in removing the wall mirror? I have one I’d like to remove myself if possible. 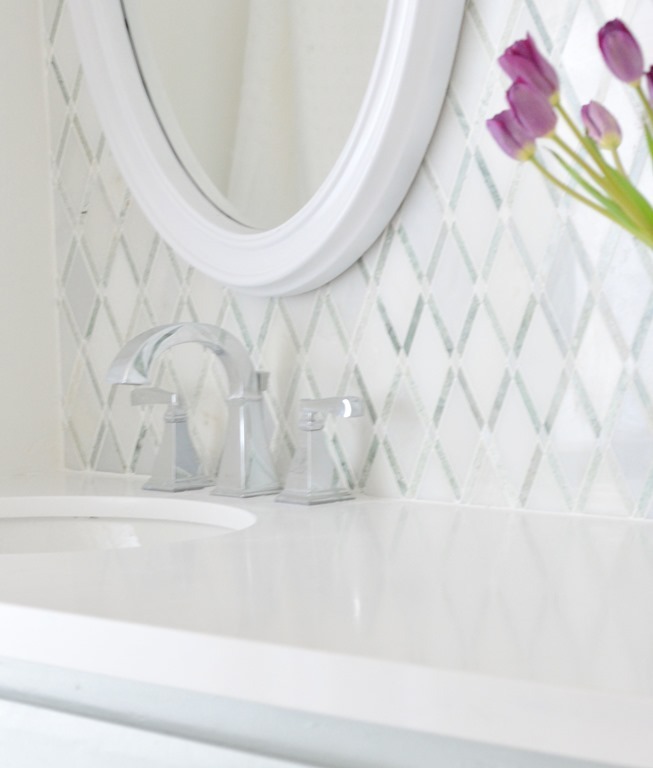 I have to say, this is the most gorgeous bathroom DIY makeover I’ve ever seen–by far! You have such a flair for envisioning and pulling awesome components together into one, magical beauty. LOVE!! I had noticed the back of my own bathroom cabinet doors having the same contemporary shaker style, but I can’t switch mine unless I heavily fill & paint (wanted to gel stain), because they have those HUGE, recessed hidden hinges. But in the thinking, I realized…the faux drawer fronts also can be reversed! They don’t have shaker trim on the other side, like the doors, but neither do they have that telltale tapered edge of the 90s cabinets. 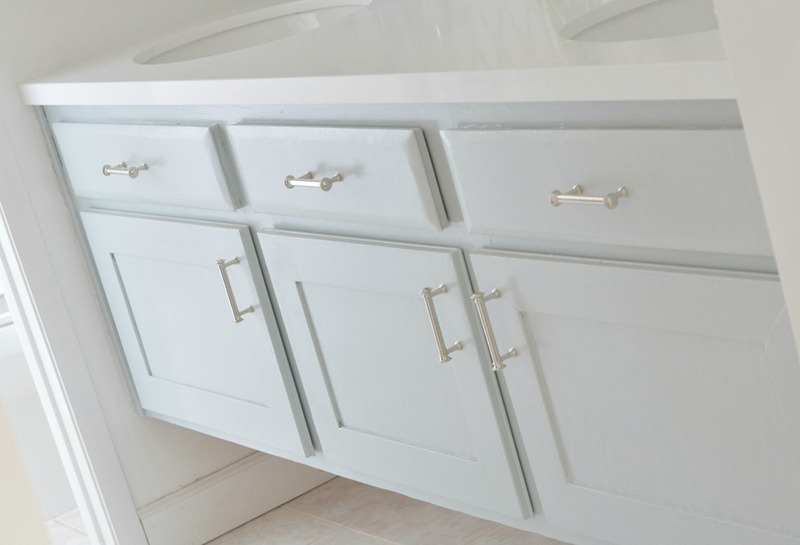 I know that won’t help for real drawer fronts, but my powder room only has faux drawer fronts, which aren’t even glued in–those are typically clamped in, & easy to reverse. To “contemporarize” real drawer fronts & even doors, I’ve been toying with the idea of laying a flat, shaker-style frame (diy) over the existing one, then using wood filler on the little gap at the outside (again, possibly necessitating paint, but at least no huge hinges to deal with detaching & reattaching). Then in the inner part of the frame, just glue in a tiny concave quarter-round or other petite trim. Absolutely stunning transformation. It gives me hope for our builders grade cabinets! I did have one question about the lights. I saw the wires but I wondered how you mounted the fixtures to the tile? Will be also redoing a master bath from the 60s and the vanity (long double sink) will be replace and I am excited abt.everything except how LOW the vanity is. My handy man says he will add on to the bottom to raise it when he does the tile. That is great but what is the best height to raise it to?? We, too, have the massive mirror but am on a shoestring so I am planning on building a vertical cabinet in the middle with a drawer on the counter and then glass display shelves above that. Haven’t seen this done – if anyone has tried it – let me know anything I should know! Thanks!